Greetings all - happy to buy a new brush carrier assembly if required. Just trying to make sure it is required. Took the whole robot apart, cleaned everything. The gears in the side of the brush carrier were surprisingly clean after several years of long-haired animal pickup. I assume better sealing is one of the features of this one, advertised as "for pets" at Costco ~2015. I have put +12v on the brush motor and it spins up just fine, but when I plug the brush assembly back into the robot, there is no brush spinning. The vacuum and side brushes work just fine. I wondered if the Dirt Detect sensor somehow influences the brush motor, because that has been pretty dirty (?) but based on the description I found online of the sensor, I don't see how it'd impact brush spinning. Is it possible there's a problem with the robot motherboard? You had confirmed your CHM motor is working by applying 12v power to the CHM motor. Is there any chance that water/liquid got into your 655? Water damage is one of the cause of CHM H-bridge failure. TechGuy wrote: You had confirmed your CHM motor is working by applying 12v power to the CHM motor. Oh yes, more than just a chance! I have a two-year-old who likes to mess with the dogs' water dish. It's very annoying. Thanks for the H-bridge info, I'll check it out. Meantime, what's the fix for that, assuming it's bad? I followed @a1robotrepair's post to fix all H-bridge circuits. Good luck. Welp. Roomba battery is dead from being off the charger for a week. Will have to do the self-tests tomorrow. If I can't fix any problems with the board, guess I'll have to try my luck with eBay huh? Probably your best less painful solution. TechGuy wrote: I followed @a1robotrepair's post to fix all H-bridge circuits. Good luck. For that matter, the top faceplate that appears so easy to remove in videos was quite difficult... seems to have "glued" itself down near the center button area. Dunno. 1) Are all x00 series motherboards the same? Or do I need to find one specifically for a 655? 2) What kind of price target should I be looking to hit here? Motherboard of 500 and 600 series Roomba are interchangeable. I have not worked 600 series motherboard with the WiFi support. I don't know whether they can be used in your Roomba. If you don't need scheduling function, you can get a cheaper 530 motherboard for $40. There is lots of residue at the CHM motor connector (near R358). Pin 1 and 2 are covered with residue. You can get a bottle of 99% rubbing alcohol. Submerse your motherboard in 99% alcohol. Use an old tooth brush to clean your motherboard. Let it dry or use compress air to get rid of the alcohol. If the power transistors was not damage with water/liquid, you may get it working again. I would say 20% chance that it may work without replacing the H-bridge transistors. Good luck. The CHM motor H-bridge transistors are mounted on 2 heat sinks on the other side of the motherboard. Would consider just buying a "Parts Only" Ebay Roomba, as you have the accessories. Only problem I've encountered with them is bad battery. That way, your existing one can become spare parts. 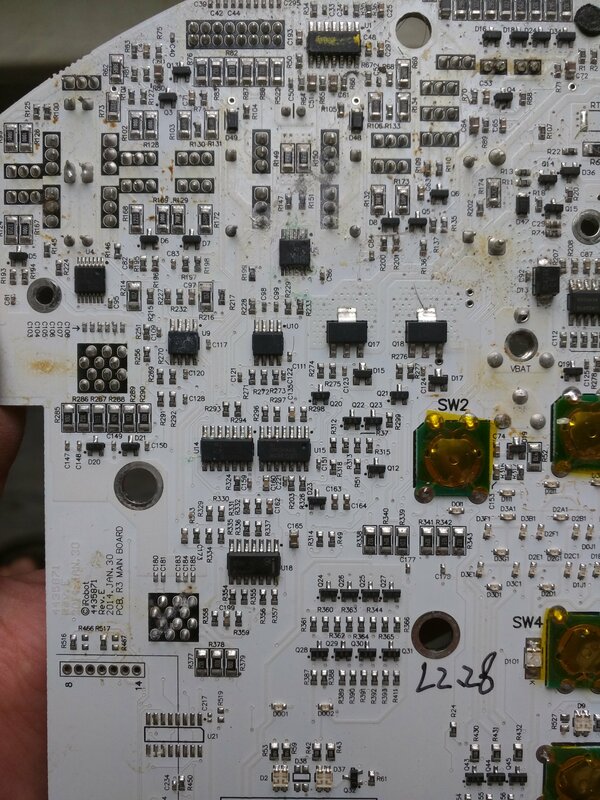 I'm already looking at some "parts only" eBay robots... but who can tell if they have a clean board or not? There's one labeled "Looks okay, found in a garage. No charger. As is" for $40; I'm tempted to grab that thing. Appreciate everyone's thoughts here. Guess it's off to eBay I go!